"Buzzing Around the Pollinator Sites"
Feed a Bee is a major initiative of the Bayer North America Bee Care Program to increase food for bees and other pollinators by planting wildflowers and establishing additional forage acreage across the united States. To date, with the support of 900,000 people around the country and more than 115 cross-industry partner organizations, Feed a Bee has distributed more than 3 billion wildflower seeds to plant forage for honey bees and other pollinators. Oneida County requested and received a $5,000.00 Bayer Grant to create educational pollinator gardens at four locations. (1) Healing Nature Center, (2) The Oneida County Courthouse, (3) The Three Lakes Center for the Arts, and (4) The Three Lakes Historical Society. Some of our projects have received national recognition. Check out the stories HERE. 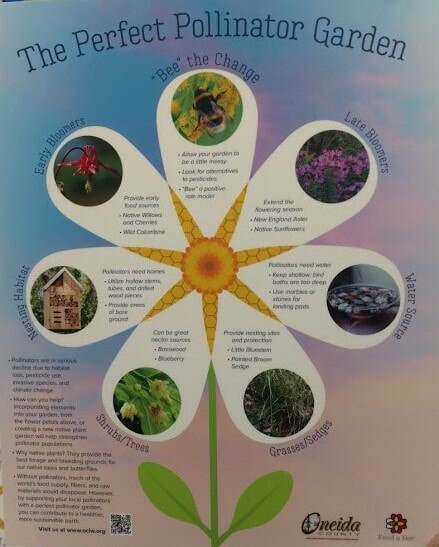 The Bayer grant will support educational signage installed at all four sites to engage citizens in promoting pollinators and their habitat, and host an open house for the Courthouse and Center for the Arts/Three Lakes Historical Society project locations. Work has already begun at the Healing Nature Center. The Courthouse location (East side along Baird Avenue) has broken ground as of October 30, 2017. Photos are on line now for each site. Click on each location to go directly to their page. ​ Due to the fact that the earlier "Roadside Pollinator Grant" project was so successful in the Three Lakes area, the Town of Three Lakes donated and earmarked $750.00 in funding to support building a pollinator garden at the Three Lakes Fire Department. Work has been completed at that site.